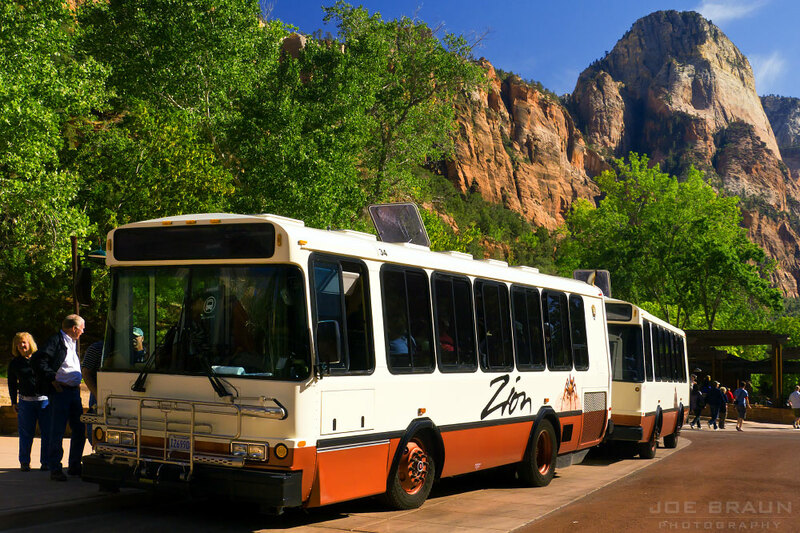 Due to the large amount of visitors to Zion National Park, a free shuttle bus system has been put in place to deal with traffic and parking problems in the main canyon and in the neighboring tourist town of Springdale. The shuttle buses operate during the popular tourism months which now run from February through November. The shuttle system helps keep Zion Canyon serene, although the surge of tourism over the past few years has pressed this system to the limit. If you are planning on driving into Zion National Park for the day, note that the primary parking lot for Zion Canyon is located at the Visitor Center just inside the southern entrance of the park, but this lot typically fills up by mid-morning on high visitation days. The free Springdale Shuttle helps to alleviate this problem of limited parking. If you are staying at a hotel/motel in Springdale, simply leave your car behind and take the Springdale Shuttle to the park entrance. If you are visiting Zion for the day, you can park in one of Springdale's various parking lots or roadside parking spots, but you must now pay for parking in town and you will get ticketed if you park in prohibited areas (like side streets with "no public parking" signs). Note that on high visitation days (summer tourist season, holidays, etc. ), searching for parking and entering the park can be an absolute nightmare. If you are staying in Springdale or have parked in Springdale for the day, walk to the nearest town shuttle-bus stop and a buss will take you up to the Zion Canyon Theater stop near the entrance to Zion National Park. Cross over the Pedestrian Entrance to pay the NPS entrance fee. The Visitor Center is only a stone's throw away as is the line to ride the Zion Canyon Shuttle. Think of this as a guided tour bus within the park. Starting at the Zion Canyon Visitor Center, this free shuttle takes visitors on a scenic ride up Zion's main canyon, making several stops at interesting locations and trailheads, including the Zion Lodge, the Grotto (start of the Angels Landing hike), Weeping Rock, and the Temple of Sinawava (close to the Zion Narrows where the steep canyon walls converge). Since shuttles come regularly, feel free to get off at any spot, explore, and then get on the next shuttle. Below is a complete list of stops and what is interesting about each. The Zion Canyon Shuttle starts at the Visitor Center, located just north of a Zion National Park entrance near Springdale. Also in the vicinity of the Visitor Center are the Watchman Campground, the South Campground, the Pa'rus Trail and the Watchman Trail. This stop is at the Zion Human History Museum off of Route 9. The museum (which was the previous Visitor Center through the 1980s) is open March through November, 10am to 5pm (or 6pm in summer). Restrooms and additional parking are available as are great views of the Altar of Sacrifice and the Bridge Mountain Arch. This minor stop is at the junction of Route 9 and the Zion Canyon Scenic Drive. (No vehicles are allowed down the Zion Canyon Scenic Drive during shuttle season unless visitors are staying at the Zion Lodge.) This stop also provides easy access to the river and is the end of the Pa'rus Trail. This minor stop has a short path that leads to a viewpoint of the Court of the Patriarchs. Across the road is the path and bridge that leads to the not-so-popular Sandbench Loop horse and foot trail. This is a big stop for the Zion Shuttle, where many people will be getting on and off. The Zion Lodge has several restaurants, a gift shop, indoor restrooms, and a grand lawn with a majestic cottonwood tree that invites visitors to stay and relax. Across the road is the start of the Emerald Pools Trail and the horse stables for those looking to ride along the Sandbench Loop. The Grotto used to be a campground and the site of the original Visitor Center, but now it is an isolated picnic area with a water fountain and primitive bathrooms. It is the starting point for the legendary Angels Landing hike, West Rim Trail, and the Kayenta Trail (an alternate approach to the Emerald Pools Trail). Weeping Rock is the starting point for many interesting hikes up and out of the east side of the canyon: Weeping Rock, Observation Point, East Rim Trail, Hidden Canyon, Cable Mountain, and Deertrap Mountain. This stop has a primitive toilet and easy access to a nice stream flowing from Weeping Rock. This stop isn't the starting point for any featured trails, but you may want to get out to see a good view of the Great White Throne with Angels Landing in the foreground. Climbers can often be spotted making their way up Angels Landing. There is access to the river and trails of use if you want to hike to the previous or next stops. This is the end of the line for the shuttle, a beautifully quiet spot where everybody will want to get out and take a stroll to the river. (Bathrooms and water fountains are available.) This is the starting point for the Riverside Walk and the classic Zion Narrows Day Hike. The National Park Service does not offer free shuttle service to any other parts of the park, but several outfitters in Springdale offer shuttle services for a fee, taking hikers to various remote trailheads such as Chamberlain's Ranch (for the Zion Narrows hike), the Subway, Lava Point, Lee Pass (in the Kolob Canyons section), and the East Entrance Trailhead. To see the official shuttle dates and times, view the NPS Shuttle System page. While you can drive down the Zion Canyon Scenic Drive during a few months in the off-season, the park is still pretty popular in winter, so parking at the trailheads may still be a problem if you don't get an early morning start.